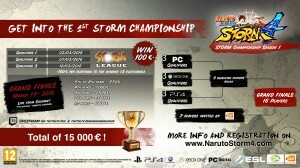 In a bid to position Naruto Shippuden: Ultimate Ninja Storm 4 in the pro-gamer fight scene Bandai Namco have launched The Storm Championship. Bandai Namco are inviting people who believe the game is about nothing more than button mashing to put their attitude where their mouth is and compete for a share of a €15,000 prize pool. You’ll find more info on the official site. Chris said Ultimate Ninja Storm 4 has some of the best fighting mechanics he’s ever played in our review where he scored it 9/10. Think you’ve got what it takes? Then practice your jutsu, sharpen your kunai and meld your chakra, it’s time to fight.